On 2 May 2015, The Cube hosted Creative Lab, a two-day professional development program designed to connect educators, curriculum writers and academics to STEAM learning experiences through hands-on workshops. Conceived by the Queensland Museum in partnership with QUT The Cube, the program provided a platform to further the institutions’ commitment to creative, innovative ways of learning and teaching. For day two of Creative Lab, The Cube delivered four workshops developed and facilitated by The Cube’s public programs team, pre-service teachers, alumni and current students from the Faculty of Education, Creative Industries and Science and Engineering Faculties, games industry veteran Matt Ditton, and digital media artist/curator Lubi Thomas. Each workshop provided an opportunity to experience different technologies through a STEAM learning framework. Creative Lab (STEM to STEAM: 21st Century Learning) from CubePP on Vimeo. Image and video by Kate O’Sullivan. Pre-service teacher Jess Schofield shares her experience at Creative Lab, held at The Cube and Queensland Museum last month. 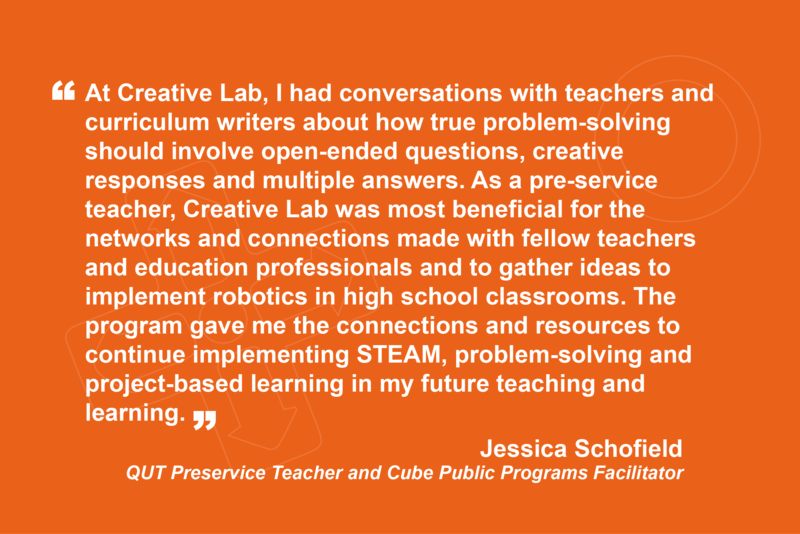 Jess: The Creative Lab program at QUT The Cube was a chance for educators from various fields to collaborate on ways to implement STEAM (science, technology, engineering, art and maths) in the classroom. As a pre-service teacher in the areas of mathematics and English the sessions were a great way to further open my mind to ways technology can be utilised across all disciplines in education. I have been a facilitator of the LEGO Education programs at The Cube since their inception in 2013. At Creative Lab, I had the opportunity to facilitate the Design Engineering sessions using the LEGO Mindstorms EV3 technology. This tool allows for all disciplines of STEAM to come together under the banner of problem-solving and project based learning. I’ve had many discussions in recent months about what problem-solving can be defined as and how these skills can be acquired in a classroom situation. In maths, we often give students “worded questions” and label it as “problem-solving” or “real-life”. But in reality, the only problem they have to solve is to interpret the words and uncover the routine, knowledge-based problem. At Creative Lab, I had conversations with teachers and curriculum writers about how true problem-solving should involve open-ended questions, creative responses and multiple answers. The Design Engineering workshop was a space to further explore this and the EV3 robots proved a perfect tool to guide that exploration. Design Engineering at Creative Lab was a space where networking took place and ideas were shared throughout the room. The participants had varying levels of experience, came from a variety of educational fields and each had their own expectations and outcomes from the session. Challenges were set to have robots manoeuvre objects within a Mars exploration context and using a combination of programming skills and physical design features. Although each of the eight groups was set the same challenge, eight very different solutions were presented. Participants went through the process of brainstorming, prototyping, testing, improving then giving and receiving critical feedback. There was a focus on teamwork and playing to strengths of individuals. The conversations that were had around STEAM in the classroom were beneficial to all participants. We had the opportunity to share our own experiences of how the LEGO Mindstorms EV3 robots have been used within our own schools and contexts, how they could be used in the future and make connections with colleagues to draw on the strengths and expertise of others. As a pre-service teacher, Creative Lab was most beneficial for the networks and connections made with fellow teachers and education professionals and to gather ideas to implement robotics in high school classrooms. I feel competent in my knowledge of robotics and I’ve facilitated a wide variety of workshops to many audiences in the past. Moving forward, my goal is to implement long term robotics programs in high school settings. Creative Lab was the first step towards that goal. The program gave me the connections and resources to continue implementing STEAM, problem-solving and project-based learning in my future teaching and learning. Over the coming weeks, we’ll be revisiting Creative Lab from the perspectives of those who participated in or facilitated workshops. This week, interior designer and pre-service teacher Leighann Ness Wilson, a participant at the program, will share her thoughts on Creative Lab. Leighann: The Creative Lab workshops at QUT The Cube were an opportunity for educators from various sectors to experience and interact with the concept of STEM to STEAM. As an interior designer currently re-training to become a high school teacher, this was a wonderful opportunity to combine the core elements of my two vocations. The torrential rain of the previous night dried away, and the sun came out on a clear Brisbane day. Educators were welcomed to The Cube, the perfect setting for things to get interactive and fun. At the littleBits workshop, facilitator Jacina Leong encouraged us to “reframe problems as opportunities’’ as we brainstormed, collaborated and essentially played with the technology to prototype an idea. At the essence of all of the workshops was the notion that the technology itself (be it littleBits, LEGO EV3 or MaKey MaKey) is a tool, not a learning outcome. As was re-emphasised in the discussion panel at the end of the day, educators should embrace experiences that allow them to explore and learn alongside their students. The overarching theme of Creative Lab was to provide ways, or indeed reason, to inject creativity (the A for Arts) into other school subjects (Science, Technology, Engineering and Maths). From a design perspective, this seems simplistic and almost obvious. Design is essentially problem solving which requires one to think creatively. Pedagogical practice that allows students opportunities to develop skills in critical thinking, problems solving and innovation requires teachers also to think creatively. Unfortunately, it is often the case that the notion of creativity is seen as the realm of a select few. If critical and creative thinking are fundamental to successful learning, educators must allow and encourage creative thinking in all its forms. Collaborative projects, such as the ones we experienced at The Cube, particularly and ideally cross-curricular, provide individual students with opportunities to identify and be rewarded for their unique strengths, while facilitating a stronger understanding of themselves and building confidence in a multitude of ways. Educators are encouraged to acknowledge their own inherent creativity and understand that creativity comes in many forms and can be applied ubiquitously. Creativity and innovation are amongst the most highly valued and useful skills of the modern world. In exploring the notion of STEM to STEAM and facilitating workshops using various technological tools, Creative Lab introduced some real ways to value-add to education as a whole. Pedagogical techniques such as these that promote creative thinking are crucial, particularly when viewed in the context of equipping students with the skills to meet the challenges of the 21st century. Since 2013, The Cube has worked in partnership with the QUT Faculty of Education to provide professional learning opportunities for pre-service teachers. The Cube provides a number of programs that connect pre-service teachers with the STEAM learning and teaching framework. 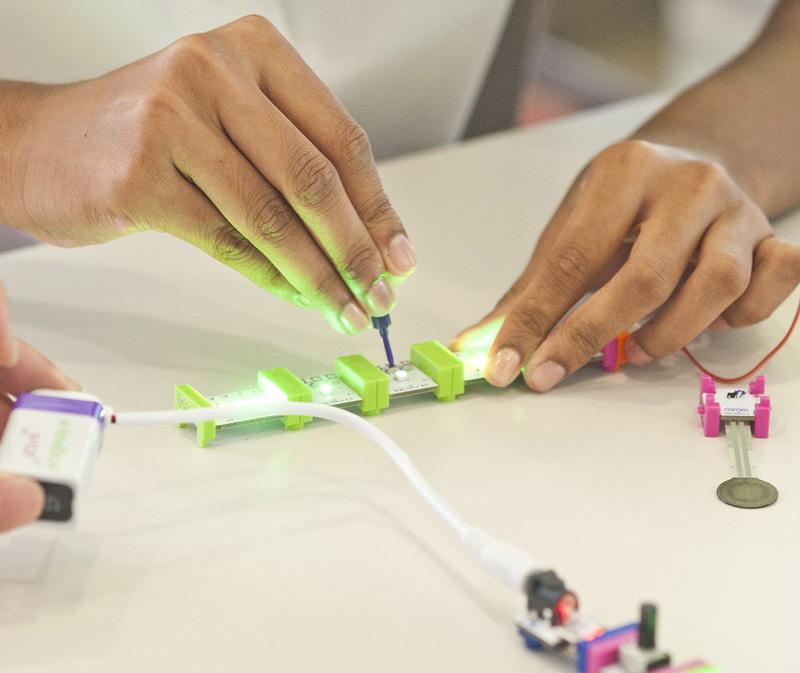 Jessica Schofield, a QUT pre-service teacher and Public Programs Facilitator at The Cube, talks us through her experiences using the toolkit littleBits, a hands-on, modular kit designed for prototyping and inventing with electronics. Describe your experience using littleBits. I’ve worked with littleBits as a tool for middle years education. I find them easy to use from an educator’s perspective. littleBits are a tool that I enjoy experimenting with outside of workshops as there is so much to learn with them. How did the audience respond to littleBits? Audiences (whether kids or adults) often respond with the phrases “that is so cool”, soon followed by “can I play with them”. littleBits are a tool that can produce outcomes quite quickly and are easy to use even when it is your first time. Audiences engage quite willingly and easily with littleBits. One of the greatest parts about introducing people to littleBits is the creativity you see emerge and the valuable conversations and sharing sessions that can be had about new or future ideas with the resource. How does littleBits connect to areas of the curriculum? At face level, littleBits links quite explicitly to the ideas of electricity and circuits encountered in the upper primary/junior secondary curriculum. However, when working within the broader context of STEM or STEAM, littleBits is right at home. Curriculum can break content into defined subjects; littleBits represents how these boundaries are blurred in real life. It draws together the students’ scientific and technological knowledge and curiosities and encourages creativity when exploring their ideas. Would you recommend littleBits as a learning tool to other educators? Learn more about collaborative and immersive teaching experiences at Creative Lab 2015, a two-day hands-on professional development program aimed at equipping STEM educators with the knowledge and skills to innovate learning through the framework of STEAM (Science, Technology, Engineering, Arts, Mathematics). Creative Lab is presented by The Cube, Queensland Museum and kuril dhagun, State Library of Queensland. The concept of integrating arts into STEM teaching has been gaining momentum in classrooms around the country, as teachers are beginning to adopt the creative, interactive approach of STEAM. Terry Deen, teacher at Kelvin Grove State College in Queensland and 2014 Smithsonian Cooper-Hewitt Fellow, talks us through his approach and experiences of STEAM in the classroom. Through the 2013 and 2014 JumpstART program (a middle school art and design excellence program for students in the Brisbane City Cluster) students work through a series of hands-on creative pathways, which culminated in an interactive exhibition. MaKey MaKey played a key role in the development of artworks and in the curatorial process. Students used MaKey MaKey to determine how audiences would engage with their conceptual art artistic outcomes in an interactive rather than passive exchange. How did the students respond to these toolsets? Through Kelvin Grove State College’s JumpstART program, students worked in groups to explore the possibilities of MaKey MaKeys. Groups brainstormed configurations of conductive elements and interface design to determine how best to use MaKey MaKey kits as tools for communicating ideas. Through brainstorming, experimenting and refining their projects, student groups created highly engaging MaKey MaKey installations that broadened perceptions of middle school art events for the students themselves, their families and the broader College community. How do they connect to areas of the curriculum? MaKey MaKeys and littleBits are 21st Century learning tools that provide teachers and students with dynamic opportunities to evidence creative and critical thinking across a range of subject disciplines. The tech devices enable teachers to meaningfully engage students in brainstorming, experimentation, prototyping, testing and refining processes that link directly to a range of standards across STEAM education. Would you recommend littleBits/MaKey as tools for learning to other educators? I recommend littleBits and MaKey MaKeys as learning tools for educators who are open to learning through risk-taking, collaboration, creativity and immersive interdisciplinary experiences. The Cube, Queensland Museum and kuril dhagun, State Library of Queensland are gearing up for Creative Lab 2015 – a two-day hands-on professional development program aimed at equipping STEM educators with the knowledge and skills to innovate learning through the framework of STEAM (Science, Technology, Engineering, Arts, Mathematics). Held on 1 & 2 May 2015, Creative Lab will provide the opportunity for educators to explore new and engaging ways of connecting students with STEM through a STEAM learning framework, which encourages an experiential approach to learning. We sat down with The Cube’s Public Programs Curator, Jacina Leong, to discuss why the STEAM framework is an essential part of 21st Century learning, and how this new way of thinking will contribute to schools and education environments. STEAM is a 21st Century framework for learning and teaching. In our increasingly connected world, breaking down the barriers between domains of knowledge is timely. In our rapidly changing world, where global challenges require creative and innovative solutions, connecting divergent thinkers is essential. What do you hope Creative Lab will achieve? The integration of the Arts into STEM is about fundamentally rethinking how we learn, and ensuring that experimentation, exploration and critical thinking are central to the learning experience. I hope that Creative Lab will provide a platform for educators to recognise this value and to better understand how this type of framework can be introduced, at a practical level, into the classroom. How can QM/The Cube contribute to the adoption of STEAM in schools and other education environments? The Cube – and, more broadly, QUT – has a well-established culture of collaboration and a commitment to practical engagement. The Cube is paving the way for others to adopt STEAM – by providing a framework through our engagement programs, remaining responsive and on pulse, and working with the broader community to help us define what STEAM is and what it can be. What can delegates expect to ‘take home’ from Creative Lab experiences? Are you an educator who is passionate about innovative teaching and engaging students with STEAM? Check out Creative Lab for more information on how you can put yourself at the forefront of STEAM education.